Melky Cabrera...Wife's name is Johana Medina... Has four daughters; Diana (1/15/10), Kaylee (10/5/10), Meilanny (7/14/12) and Mianna (4/14/18)...Was honored with the Munson Award for his excellence and philanthropic work in the community at the 28th annual Thurman Munson Dinner in New York City on 2/5/08 vs. Oakland. Had two separate stints with Cleveland after signing as a minor league free agent on 4/25... Was assigned to Triple-A Columbus on 5/7 after a short stint in Arizona to prepare for the season...Played in 10 games with Columbus before being promoted to the big leagues on 5/20...Hit .207 (12-for-58) in 17 games with Cleveland before being designated for assignment on 6/14 when Brandon Guyer was activated from the disabled list...Elected free agency on 6/18 and re-signed with Cleveland on 7/5, appearing in nine more games with Columbus...Was promoted back to the Majors on 7/20 for the remainder of the season...Hit .302 (58-for- 192) with 12 doubles, six home runs and 28 RBI over the final 61 games of the season with the Tribe...Batted .321 (43-for-134) with 10 doubles, five home runs and 27 RBI in 42 games from 8/12 to 9/30...Homered in three straight games from 8/20-22; tied for the second-longest stretch of his career...Hit his fourth career grand slam on 8/19 vs. Baltimore...Tied a 9.0-inning career best by reaching base safely five times on 8/26 at Kansas City (three walks and two singles)...Hit .342 (38-for-111) with runners on base... Made 65 starts in right field, four starts in left field and three as the designated hitter for Cleveland. Hit .285 (177-for-620) with 17 home runs and 85 RBI in 156 combined games between Chicago (AL) and Kansas City...Finished one home run and two RBI shy of matching his career highs set with the Royals in 2011...Ranked fourth among all Major League switch hitters in batting average... Was hitting .227 (27-for-119) thru 5/12 before hitting .319 (129-for-405) with 15 home runs and 61 RBI over a 100- game stretch from 5/13 thru 9/3...Tied for ninth in the American League with 50 multi-hit games, including 14 three-hit efforts; also ranked tied for sixth with four games of at least four hits...Matched his career high (sixth time) with five RBI on 6/16 at Toronto, which included a two-run double and a three-run home run...Connected off Seattle's Felix Hernandez for a leadoff home run on 7/15...Was acquired by Kansas City on 7/30 in exchange for minor league pitchers A.J. Puckett and Andre Davis. American League Leaders: T3rd-2B (42); T5th-Multihit Games (56); T5th-OF Assists (12); T10th-3B (5). Appeared in 151 games in his second season with Chicago … led the White Sox in doubles and average (.296) and tied for the team lead in extra-base hits (61). His 47 walks were a career high, and his 175 hits, 42 doubles and 61 extra-base hits were the second-most of his career (highs in 2011) … the 42 doubles were the most by a White Sox player since Magglio Ordonez (46) in 2003. Batted .322/.352/.496 with three home runs vs. left-handers, compared to .289/.344/.445 with 11 homers vs. righties … the .322 mark vs. LHP was the 12th-best in the AL. Went 49-157 (.312) with RISP and 4-12 (.333) with the bases loaded … was 3-11 (.273) with one RBI as the DH (four games). Ranked fourth in the majors with a .366 average (34-93) in July … his .404 on-base percentage in July was a season high.  Hit in the following lineup spots: 12 games at No. 2 (.308/.357/.481), 33 at No. 3 (.303/.358/.472), 39 at No. 4 (.263/.281/.441) and 45 at No. 5 (.314/.380/.438). Recorded a game-winning, RBI single in the seventh inning on 4/9 vs. Cleveland … registered five consecutive multihit efforts from 4/9-15, going 10-21 (.476). Delivered a game-winning, RBI single in the ninth on 4/15 at Tampa Bay (Sox won, 1-0, on Chris Sale's shutout) … hit his first homer on 4/21 vs. the Angels, a solo shot off Jered Weaver. Registered his first four-hit game on 5/6 vs. Minnesota … recorded his first multiple extra-base hit game, including a goahead, RBI double in the seventh, on 5/15 at the Yankees … hit his third career grand slam on 5/27 at Kansas City. Was placed on the Family Emergency Leave List on 6/4 and reinstated on 6/7 … missed three games while on leave … went 2-5 on 6/7 vs. Washington in his return to the lineup. Recorded his 1,500th career hit on 6/13 vs. Detroit … tied the game at 6-6 with a two-run homer off Koji Uehara in the eighth on 6/22 at Boston (four RBI total) … hit his third homer in the span of six games on 6/24 vs. Toronto. Recorded his third three-plus hit effort in a span of five contests on 6/26 vs. Toronto, going 3-4 with a RBI. Left the game on 6/28 vs. Minnesota due to soreness in his right wrist … was diagnosed with a sprained right wrist and missed five games from 6/29-7/3. Snapped a 1-1 tie with a game-winning, solo home run in the seventh inning off Wade Miley on 7/19 at Seattle … recorded his 13th career game-ending hit on 7/24 vs. Detroit, a single off Bruce Rondon in the ninth inning.  Registered four straight multihit efforts from 7/28-31, batting .556 (10-18) with four doubles and five RBI during that span. Forced extra innings with a game-tying, RBI single in the ninth inning on 7/30 at Minnesota … Sox won, 6-5, in 10 innings … marked his second career game-tying hit in the ninth or later (also 5/24/09 vs. Philadelphia with the Yankees). Hit his 300th career double on 8/16 at Cleveland … walked three times on 8/23 vs. Philadelphia, his fifth career game with three or more walks.  Snapped a 38-game homerless stretch with a solo shot on 9/3 at Minnesota … surpassed his 2015 total with a two-run home run, his 13th, on 9/23 at Cleveland. American League Leaders: T9th-G (158); T10th-2B (36). Appeared in a career-high 158 games in his first season with the White Sox. His totals in hits (172), doubles (36) and RBI (77) were his highest since 2011 with Kansas City. Led the White Sox in games and doubles and ranked third in hits, total bases (248), extra-base hits (50) and OPS (.709). Batted .286 (131-458) with 10 home runs, 59 RBI and a .748 OPS vs. right-handers, compared to .240 (41-171) with two homers, 18 RBI and a .600 OPS vs. left-handers … hit .359 (46-158) with 20 RBI vs. the American League East. Ranked fourth in the AL with a .369 average (38-103) in July after batting .276 (21-76) in April, .220 (27-123) in May and .274 (26-95) in June. Hit .304 (58-191) with six homers and 27 RBI from the No. 3 position in the lineup and .281 (45-160) with five home runs and 24 RBI from the cleanup spot. Batted .287 (85-296) with 24 doubles, eight home runs, 43 RBI, a .456 slugging percentage and .782 OPS in the second half, compared to .261/.304/.339 in the first half. Ranked among the AL second-half leaders in doubles (T1st), runs scored (T9th, 85) and extra-base hits (T9th, 33). Went 1-4 in his Sox debut on Opening Day at Kansas City … singled off Yordano Ventura in his first at-bat … recorded his first multihit effort on 4/12 vs. Minnesota. Hit safely in six straight games from 4/18-23, batting .462 (12-26) with two doubles, four RBI, five runs scored and four multihit efforts. Recorded four hits on 4/18 at Detroit, including his first extrabase hit and RBI with Chicago. Connected on a game-ending single in the bottom of the ninth inning on 4/20 vs. Cleveland, his 11th career walkoff hit. Drove in four runs on 5/6 vs. Detroit, including a game-tying, three-run home run in the eighth inning off Joba Chamberlain. Recorded a RBI in three straight games from 5/13-15 … posted a six-game hitting streak from 6/12-17, going 9-23 (.391) with two doubles and two RBI. Hit .383 (54-141) with 15 doubles, two triples, six home runs, 30 RBI, 23 runs scored and a 1.065 OPS during a 36-game span from 6/21-8/2 … recorded 17 multihit efforts. During that stretch, ranked among the major-league leaders in doubles (2nd), total bases (2nd, 91), extra-base hits (2nd, 23), average (3rd), RBI (T3rd), slugging percentage (4th, .645), OPS (5th) and on-base percentage (T7th, .419). Collected a career-high five hits on 6/21 vs. Texas … homered on 6/28 at Detroit and 7/1 at St. Louis. Connected on a game-winning, two-run double with two outs in the eighth inning on 7/6 vs. Toronto … the hit helped Chris Sale earn the win in a complete game, six-hit effort. Registered seven straight games with multiple hits and at least one RBI from 7/23-29, the longest streak in club history and the longest in MLB since Cristian Guzman from 7/24-8/1/09 … joined Atlanta's Brian McCann (2006) as the only major leaguers since 1965 to compile such a streak during team wins (Elias). His nine-game streak with a RBI from 7/21-29 was the longest of his career and longest by a White Sox since Paul Konerko from 7/2-16/00 (also nine) … his seven consecutive multihit efforts from 7/23-29 was the longest stretch since Magglio Ordonez from 7/22-30/03 (eight straight). Recorded his fourth career multihomer game, and third with one from each side of the plate, on 7/23 at Cleveland … each of his first four career multihomer games came with a different club (Yankees, Royals, Blue Jays, White Sox), the only active player to accomplish the feat (Elias). The multihomer effort marked the first for Chicago in 2015 … became the sixth player (ninth time) in Sox history to homer from both sides of the plate (last Nick Swisher, 6/30/08 vs. Cle.). Recorded four hits on 7/28 at Boston, 8/30 vs. Seattle and 9/14 vs. Oakland … connected on a game-ending single in the 14th inning on 9/14 at U.S. Cellular Field. Went 3-4 with a two-run homer off Justin Verlander, the 100th of his career, on 9/23 at Detroit. Spent his second season with Toronto … missed the final 22 games after undergoing surgery to repair a fractured right pinky finger suffered diving back to third base on 9/5 at Boston...At the time of his injury (9/6), ranked second in the major league with 171 hits … also was tied for third in the American League in multihit games (51), ranked seventh in doubles (35) and eighth in average (.301)...His 13 outfield assists tied for the third-most in baseball and were the most by a Blue Jays left fielder since Candy Maldonado in 1992 (also 13)...Posted a .310 average (129-416) with 26 doubles, two triples, 11 home runs and 53 RBI against right-handers, compared to .276 (42-152) with nine doubles, one triple, five homers and 20 RBI vs. lefties...Recorded a hit in 25 of his first 26 games of the season (.347, 41-118), becoming the first player in Toronto's history to accomplish the feat...His 14-game hitting streak (.323, 21-65) from 3/31-4/15 was the longest in Blue Jays history to open a season … after going 0-4 on 4/17 at Minnesota, compiled an 11-game hitting streak from 4/18-29 (.422, 19-45)...Set a franchise record with 41 hits in March/April … homered in a career-high four straight games from 4/4-8, including leadoff shots on 4/4 and 4/6 vs. the Yankees...Matched his career high with four hits on 4/18 at Cleveland and 5/20 at Boston (11th and 12th time)...Hit his 10th home run in his 60th game of the season on 6/4 at Detroit, the fastest he reached the mark in his career...Became the 15th-fastest Blue Jay to reach 100 hits in a season (80 games) on 6/27 vs. the White Sox...Collected his 500th career RBI on 7/26 at the Yankees with a double off Chris Capuano. Missed a combined 72 games this season over two DL stints, both were left knee injuries... Missed 18 games from June 27-July 20 and was shut down for the rest of the season on Aug. 2, missing the final 54 games... Had a benign tumour removed from his spine in August, resulting in his persistent back and leg pain throughout season. In 28 games in May, hit .319/.361/.460 (.821 OPS), with 10 doubles, two home runs, 14 RBI and 15 runs scored. Recorded multi-hit games in 25 of his 88 contests this season, including nine games of 3+ hits. Hit his 1st career leadoff home run May 24, 2013 vs. BAL. Collected his 1000th career hit April 9 at DET after singling in the 1st inning off of A. Sanchez. Played in his 1000th career game April 18 vs. CWS. Appeared in fewer games (88) than any season since his debut (2005). Opened up the season with an eight-game hitting streak...On Aug. 15 it was announced by Major League Baseball that he was suspended 50 games for testing positive for testosterone, a performance-enhancing substance...Was eligible to return for the post-season, but was not added to the Giants roster...At the time of his suspension led the Majors with 159 hits and 52 multi-hit games while batting .346 -- the second-highest average in the National League... Was leading the league in runs with 84...Was named Most Valuable Player in the All-Star Game played in Kansas City, going 2-for-3 with a two-run home run...Recorded a career high 10 triples (T-5th in NL)...Batted .429 in May with three homers, five triples, seven doubles and 17 RBI...Established a San Francisco era record for the most hits in the month of May with 51... Surpassed Willie Mays, who had 49 in May of 1958... Tied Randy Winn (Sept. '05), a SF-era record with 51 hits in a single calendar month...His 39 multi-hit games were a new Giants franchise record prior to the All-Star break. 27-year-old was acquired by San Francisco from Kansas City in Nov. to provide an offensive burstto lineup ... Completed his 1st and only season with Royals in tremendous fashion, setting career highs innearly every offensive category, including batting average (.305), runs (102), hits (201), doubles (44),home runs (18), RBI (87) and stolen bases (20). ... Ranked 9th in American League in batting average andfinished 4th in A.L. in hits, 7th in total bases (309) and tiedfor 8th in doubles and runs scored. ... Finished 2nd in Majors to Yankees' Curtis Granderson with85 RBI from number 2 spot in batting order. ... Became just 6th Royals player (7th time) to reach 200+ hitsin season and 1st since 2000 (Johnny Damon, 214; MikeSweeney, 206). ... Posted 61 multi-hit games, tied for 2nd-most in MajorLeagues and 4th-best single-season total in club history. ... Tied for 6th in Majors with 13 outfield assists. ... Recorded his 2nd career 2-HR game on July 3 at Colorado,hitting solo HR in 1st inning and 3-run shot in 3rd...alsoset career-high with 4 runs scored and matched careerbestwith 5 RBI...also drove in 5 runs on Aug. 10 at TampaBay (4th time in his career). ... Hit .384 and recorded 43 hits in month of July, 2nd-mostin Majors. Spent his first season in the National League with the Braves...Got off to a slow start, batting just .195 (15-for-77) in April before hitting a combined .288 (68-for-236) from Maythrough July...Despite just 458 at bats, his second-lowest since becoming a regular in 2006, he collected 27 doubles, 1 shy of hiscareer high set in 2009. Set career highs in doubles (28) and home runs (13) in 154 games with NYY. Batted .277 (91-for-328) with eight home runs as a right-handed batter and .268 (42-for-157) with five longballs as a left-handed batter...Batted .317 (38-for-120) in the No. 9 spot in the lineup, marking the highest such average in the Majors(min. 125PA)...Recorded three outfield assists in 2009 and now has 38 career OF assists, tying for fourth-most in the Majors over the last four seasons (2006-09). His 14 assists as a center fielder over the same span are second-most in MLB behind TB's B.J. Upton (16)...Was 24-for-54 (.304) with two home runs and 19 RBI in "close and late" situations...Became just the 11th player in Yankees history to hit for the cycle on 8/2 at CWS. The four hits matched his career high...Tied his career-high with four hits 8/21 at BOS...Recorded four straight multi-hit games for the first time in his career from 8/31-9/3. Tied his season high with four RBI on 9/13 vs. BAL...Played in his 500th career game on 7/19 vs. Detroit, going 0-for-3...On 7/17 vs. DET, recorded two outfield assists for the third time in his career and first since 7/15/07 at TB...Was named the Major League Baseball Clutch Performer of the Month Presented by Pepsi Award winnerfor May. In 24 games, he batted .321 (27-for-84) with nine runs, six doubles, one home run and 11 RBI...Recorded walk-off hits on 5/15 vs. MIN and 5/23 vs. PHI...Missed four games with a bruised right shoulder, 5/27-31...Hit solo-home run in the second inning and a two-run walk-off homer in the 14th on 4/22 vs. OAK, marking his first career multi-HR game and second career "walk-off" home run (7/18/06 vs. SEA)...Hit solo-home run on 4/17 vs. CLE and a two-run homer 4/18 vs. CLE, marking just the second time in his career he homered in consecutive games (also 8/9-10/06 at CWS)...Recorded a hit in 14 consecutive games as a starter, 4/13-5/5: .368 (21-for-57) with four HR and 10 RBI...Hit safely in 29 of his 32 starts, 4/13-5/25, batting .333 (42-for-126) with five HR, 20 RBI and nine BB...Made third career Opening Day roster and his season debut was on 4/9 at BAL, as a pinch-hitter for NYY Derek Jeter in the eighth inning...2009 POSTSEASON: DS (Min. ): Hit .167 (2-for-12) in three games. LCS (LAA): Posted three multi-hit games in six contests, batting .391 (9-for-23) with two doubles, four RBI and six walks. In Game 4, had three hits and a team-high four RBI. WS (Phi): Was 2-for-13 (.154) in four games vs. PHI. Hit .273 (149-for-545) with 66R, 8HR, 73RBI and 13SB in 150 games with the Yankees in 2007 (117 starts in centerfield, 16 starts in left field and four starts in right field)...Started 101 of the Yankees' final 111 games of the season in CF (since 6/1) with the team going 72-39 (.649)...during the stretch, hit .290 (119-for-411) with 55R, 21 doubles, 7 triples, 6HR, 58RBI, 32BB and 10SB...batted .224 (30-for-134) with 11R, 3 doubles, 1 triple, 2HR and 15RBI through the first two months of the season...Tied for third in the American League with 16 outfield assists, tied for fourth with nine sacrifice flies, tied for fifth with 10 sacrifice hits and tied for sixth in the league with eight triples...His 16 OF assists tied Lou Piniella (1974) and Jesse Barfield (1989 and '90) for the fourth-highest single-season total by a Yankees outfielder in the last 50 years...led all Major-League centerfielders with 14 assists, matching Bobby Murcer's 1973 total for the third-highest total by a Yankees centerfielder in the last 50 years, trailing only Murcer (15 in 1970) and Elliot Maddox (18 in 1974)...his 14 assists mark the highest total among A.L. centerfielders since Rocco Baldelli had 15 assists in 2003 with Tampa Bay...Made his first Opening Day roster in 2007...Went 73AB to begin the season without an extra-base hit until he doubled on 4/28 vs. Boston...Hit solo-HR (#1) in 5/10 loss vs. Texas-his first HR since 8/10/06 at Chicago (AL), a span of 266AB without a home run...collected two extra-base hits in four at-bats in the game after registering just two in his first 99AB of the season...Made 11 consecutive starts from 6/1-12, batting .350 (14-for-40) with five multi-hit games...the Yankees were 9-2 in those games...Had three hits in consecutive games for the first time in his career (7/5-7/6) and five multi-hit games in six contests (7/1-7/6). 4 Was 1-for-6 with a career-high five strikeouts in 7/7 loss vs. the Angels...became the fourth Yankee-and third position player-to strike out five times in a game, joining Johnny Broaca (6/25/23 vs. Chicago), Bernie Williams (8/21/91 at Kansas City) and Andy Phillips (5/2/05 at Tampa Bay)...Hit safely in 13 straight games from 7/1-17...during the streak, hit .393 (22-for-56) with 7R, 1 double, 1HR, 7RBI and 1SB...Hit a team-high .368 (39-for-106) with 18R, 6 doubles, 1 triple, 3HR and 17RBI in 28 games in July...his 39 hits tied for third best in the Majors and his .368BA ranked third in the American League for the month...Was one of only four A.L. qualifiers whose batting average increased in each of the first four months of the season (April-July)...hit .200 (15-for-75) in April, .254 (15-for-59) in May, .298 (28-for-94) in June, and .368 (39-for-106) in July...Collected three extra-base hits in a game for the first time in his career in 8/7 win at Toronto, going 3-for-4 with 3R, 2 doubles, 1 triple and 1SH...Had 16 extra-base hits over a 17-game span from 7/21(G2)-8/7 (10 doubles, 3 triples, 3HR)...Fashioned a career-high 18-game hitting streak from 7/25-8/13, hitting .400 (30-for-75) with 15R, 9 doubles, 3 triples, 4HR, 19RBI, 1BB and 3K...according to the Elias Sports Bureau, it was the longest hitting streak by any player under the age of 24 since Jose Reyes fashioned a 20-game streak in 2005 at age 22...the last player as young as Cabrera to hit safely in 18 straight games for the Yankees was Joe DiMaggio (22 games in 1937 at age 22)...Reached base safely in 30 consecutive games (via hit, walk or HBP) from 7/25-8/27, the longest such streak of his career and the longest for any Yankee player this season...batted .328 (40-for-122) with 18R, 9 doubles, 4 triples, 4HR, 24RBI, 2HB, 7BB and 3SB during the stretch...Went a season-high 46 consecutive plate appearances without a strikeout from 8/21-9/3 (career high is 54, done in 2006)...Hit game-winning "walk-off" single in the 10th inning and tied a career high with 5RBI in 9/22 win vs. Toronto, going 3-for-7 with 1R...also drove in five runs on 7/5/06 at Cleveland...Hit safely in each of the final two regular season games (2-for-10 combined) following an 0-for-17 stretch. Was recalled by the Yankees in May and immediately provided a youthful spark and consistent play to the everyday line-up, hitting .280 (129-for-460) with 7HR, 50RBI and 12SB in 130 games (112 starts in left field, eight starts in right field and one start in center field)...tied for second in the American League with 12 outfield assists...Led all American League rookies with 75 runs, 12 stolen bases, 56 walks, 12 outfield assists and a .360 on-base percentage; ranked second with 26 doubles, third with 129 hits, fourth with 50 runs batted in, 31 multi-hit games, 180 total bases and 35 extra-base hits, and fifth with a .280 batting average...began the season with Triple-A Columbus, leading team with a .385 average (47-for-122) in 31G...had six doubles, two triples, four HR and 24RBI...Was tied for first in the International League with his .385 average, tied for second with his 24RBI and ranked third with a .566 slugging percentage...reached base safely in 28 of 30 games in which he made a plate appearance...was recalled from Triple-A Columbus on 5/9...started in right field that night vs. Boston and was 2-for-3 with his first Major-League RBI...Hit in the lead-off position for the first time in his career on 5/24 at Boston and went 2-for-4 with 4RBI and 1BB...established his single-game career high with four hits in 5/30 win at Detroit, going 4-for-6 with 1 double, 1 triple, 2RBI and 1BB...Hit safely in a career-high eight straight games from 5/29-6/5, batting .297 (11-for-37) with 10R during the stretch...scored a career-high 3R in 6/5 win vs. Boston and was 1-for-5 with 1 double and 2RBI...his strikeout in the eighth inning of 6/9 loss vs. Oakland snapped his streak of 54 consecutive plate appearances without a strikeout...according to the Elias Sports Bureau, it was the longest such streak by a Yankees rookie since Horace Clarke went 56 straight plate appearances without a strikeout in 1965...Hit first career Major-League home run in 6/15 loss vs. Cleveland...began his Major-League career with 130 homerless at-bats...according to the Elias Sports Bureau, it was the longest such streak by a Yankee player to start a career since Bobby Meacham went 281 at-bats without a home run from 1983-84...hit first career grand slam (#3) and was 3-for-4 with 2R, 1 double and a career-high 5RBI in 7/5 win at Cleveland...hit 11th-inning solo "walk-off" home run (#4) in 7/18 win vs. Seattle...according to the Elias Sports Bureau, he became the youngest Yankee player-at 21-to hit a "walk-off" home run since Mickey Mantle on 4/23/53 vs. Boston (also at age 21)...Reached base safely in 20 straight games (via hit, walk or HP) from 6/25-7/18...it marked the longest such streak by a Yankees rookie since Derek Jeter reached base safely in 23 straight games in 1996...hit .313 (31-for-99) with 2HR, 14RBI and a team-high 19 runs in 25 games in July...hit two-run HR (#7)-his second in as many games-and was 2-for-4 with 1BB and 1SB in 8/10 loss at Chicago...made his first start of the season in CF in 9/30 loss vs. Toronto, going 2-for-5. ...Appeared in two Division Series games vs. the Detroit Tigers, going 0-for-3. Split time between Double-A Trenton, Triple-A Columbus and New York ... in 106 games with Trenton, batted .275 (117-for-426) with 57R, 22 doubles, 3 triples, 10HR, 60RBI and 28BB ... in 26 games with Columbus, batted .248 (25-for-101) with 15R, 3 doubles, 3HR and 17RBI ... began the year in Trenton, playing in 75 games ... after going 0-for-4 in the Season Opener, registered at least one hit in the following nine games from 4/8-16 ... tied a career high with five hits, going 5-for-6 with 3R and a solo-HR on 4/28 vs. Norwich ... drove in 22 runs in the month of May ... scored a run in nine straight games from 5/27-6/5 ... was transferred to Columbus on 6/28 ... went 2-for-4 with a grand slam, 2R and 1SB in 6/30 win vs. Rochester ... hit .324 (11-for-34) in nine games for the Clippers with 3 HR and 11 RBI before having his contract purchased by New York on 7/7 ... made his Major-League debut that night, starting in center field vs. Cleveland ... went 1-for-4, collecting his first Major-League hit (single off Kevin Millwood in the fifth inning) ... appeared in six games (six startsin CF) with the Yankees, batting .211 (4-for-19) with 1R ... was selected to play for the World Team in the 2005 Futures All-Star Game on 7/15 in Detroit, but was unable to attend because of his promotion to New York ... was the third player on the Yankees' 25-man roster in 2005 to be selected to the Futures Game, joining 2B Robinson Cano (2004) and RHP Chien-Ming Wang (2003) ... was optioned to Columbus on 7/18 ... played 17 additional games with Columbus before being transferred back to Trenton on 8/4 ... combined to hit .269 (142-527) with 13 HR and 77 RBI in 132 games between Trenton and Columbus ... set career highs in HR, RBI and tied a career high with 13 SB ... was tied for fourth among Yankees' minor leaguers in RBI ... set a single game high with 2 triples in a game on 6/1, and tied highs with five hits in a game (4/28) and 4 RBI in a game (5/30, 6/30, 7/5) ... led Thunder with six hits in playoff series loss to Portland ... finished second in the MVP voting for the Dominican Winter League, batting .315 (35-for-111) with 18 RBI in 40 games for Las Aguilas Cibaeñas. Split the season with the Yankees' Single-A affiliates Battle Creek and Tampa ... combined to hit .304 (153-for-504) with a career-high 36 doubles, six triples, 8HR and 67RBI in 127 games ... also established a single-season career high with 83 runs scored ... had a career-best 17-game hitting streak for Battle Creek from 5/3-22/04, including nine multi-hit games ... hit .406 during the streak (28-for-69) with 15 R and 7 RBI ... was transferred to Tampa on 5/26 ... collected a career-high three doubles on 5/31 at Sarasota, going 3-for-4 ... ranked as the Yankees' #7 prospect by Baseball America ... also rated as the Yankees' best minor league defensive outfielder and best hitter for average by Baseball America. Hit .283 (79-for-279) with 2HR, 31RBI and 13SB in 67 games for Single-A Staten Island...ranked fourth in the New York Penn League with his 279 AB ... hit .371 (43-for-116) in 25 July games ... hit in 18-of-19 games from 6/30-7/19, going 0-for-9 on 7/9 at Batavia in his only hitless game during the stretch ... had a season-high 10-game hitting streak from 7/10-19, batting .476 (20-for-42) ... had a pair of five-hit games on 7/4 at New Jersey (5-for-6 with 1R, 1 double and 3RBI) andon 7/15 vs. Brooklyn (5-for-5 with 2RBI). In his first professional season, hit .335 (73-for-218) with 3HR and 29RBI in 60 games with the Yankees Rookie-League affiliate (Dominican Summer League). March 28, 2019 Pittsburgh Pirates selected the contract of OF Melky Cabrera from Indianapolis Indians. February 11, 2019 Pittsburgh Pirates signed free agent OF Melky Cabrera to a minor league contract and invited him to spring training. 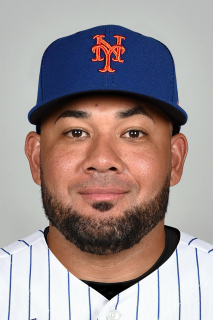 October 29, 2018 RF Melky Cabrera elected free agency. July 20, 2018 Cleveland Indians selected the contract of RF Melky Cabrera from Columbus Clippers. July 5, 2018 Cleveland Indians signed free agent OF Melky Cabrera to a minor league contract. July 5, 2018 OF Melky Cabrera assigned to Columbus Clippers. June 18, 2018 LF Melky Cabrera elected free agency. June 16, 2018 Cleveland Indians sent LF Melky Cabrera outright to Columbus Clippers. June 14, 2018 Cleveland Indians designated LF Melky Cabrera for assignment. May 20, 2018 Cleveland Indians recalled LF Melky Cabrera from Columbus Clippers. May 7, 2018 LF Melky Cabrera assigned to Columbus Clippers. May 1, 2018 Cleveland Indians signed free agent OF Melky Cabrera to a minor league contract. November 2, 2017 RF Melky Cabrera elected free agency. July 31, 2017 Kansas City Royals activated RF Melky Cabrera. July 30, 2017 Chicago White Sox traded LF Melky Cabrera and cash to Kansas City Royals for RHP A.J. Puckett and LHP Andre Davis. April 17, 2017 Chicago White Sox activated LF Melky Cabrera from the paternity list. April 14, 2017 Chicago White Sox placed LF Melky Cabrera on the paternity list. June 7, 2016 Chicago White Sox activated LF Melky Cabrera. June 3, 2016 LF Melky Cabrera roster status changed by Chicago White Sox. December 16, 2014 Chicago White Sox signed free agent LF Melky Cabrera. October 30, 2014 LF Melky Cabrera elected free agency. October 30, 2014 Toronto Blue Jays activated LF Melky Cabrera from the 60-day disabled list. October 31, 2013 Toronto Blue Jays activated LF Melky Cabrera from the 60-day disabled list. September 3, 2013 Toronto Blue Jays transferred LF Melky Cabrera from the 15-day disabled list to the 60-day disabled list. Left knee irritation. August 2, 2013 Toronto Blue Jays placed LF Melky Cabrera on the 15-day disabled list. Left knee irritation. July 21, 2013 Toronto Blue Jays activated LF Melky Cabrera from the 15-day disabled list. July 18, 2013 Toronto Blue Jays sent LF Melky Cabrera on a rehab assignment to Buffalo Bisons. July 15, 2013 Toronto Blue Jays sent OF Melky Cabrera on a rehab assignment to New Hampshire Fisher Cats. July 12, 2013 Toronto Blue Jays sent OF Melky Cabrera on a rehab assignment to Dunedin Blue Jays. June 28, 2013 Toronto Blue Jays placed LF Melky Cabrera on the 15-day disabled list. Left knee tendinitis. November 19, 2012 Toronto Blue Jays signed free agent LF Melky Cabrera. November 3, 2012 LF Melky Cabrera elected free agency. October 29, 2012 San Francisco Giants activated LF Melky Cabrera. October 12, 2012 San Francisco Giants reassigned LF Melky Cabrera to the minor leagues. August 15, 2012 San Francisco Giants placed LF Melky Cabrera on the restricted list. November 7, 2011 Kansas City Royals Traded LF Melky Cabrera to San Francisco Giants; San Francisco Giants Traded LHP Jonathan Sanchez to Kansas City Royals and Richmond Flying Squirrels Traded LHP Ryan Verdugo to Northwest Arkansas Naturals. December 10, 2010 Kansas City Royals signed free agent Melky Cabrera. November 10, 2010 OF Melky Cabrera assigned to Aguilas Cibaenas. October 18, 2010 Atlanta Braves released LF Melky Cabrera. November 9, 2009 Melky Cabrera roster status changed by New York Yankees.